Explorers of energy medicine will welcome this first-person account of a renowned medical intuitive describing her experiences in helping people heal. Shannon McRae is a gifted clairvoyant and healer in the tradition of Dora Kunz and Delores Krieger, cofounders of Therapeutic Touch. Shannon weaves case stories with cutting-edge science to describe her remarkable work with clients at the cellular level, from healing a headache to repairing an eardrum to removing cancer and alleviating depression. She emphasizes the importance in healing of positive thought, forgiveness, and the patient’s letting go of emotional pain and resistance to health. Each of her examples is instructive, and each gives hope, no matter what the physical or mental condition might be. The epilogue shares Shannon’s insights about life after death and the realm of unseen helpers. The Scientific and Medical Network Reviews Three Quest Titles! The Scientific and Medical Network has reviewed three of our titles in the Winter 2016 issue of their journal Network Review! The Healing Effects of Energy Medicine: Memoirs of a Medical Intuitive by Shannon McRae, Ph.D., with Scott E. Miners, has been reviewed in Retailing Insight magazine. The Healing Effects of Energy Medicine author Shannon McRae was recently interviewed by Dr. Jeanette Gallagher on the Alternative Health and Wellness Radio show. 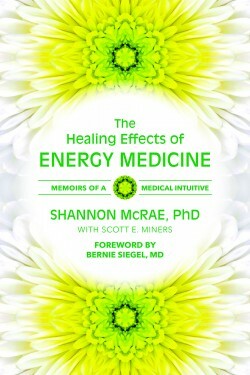 The Healing Effects of Energy Medicine: Memoirs of a Medical Intuitive by Shannon McRae with Scott E. Miners has been reviewed in the Fall 2015 issue of Foreword Reviews. "One of the great insights of our era is that human consciousness is not isolated in single individuals. Our thoughts and intentions mingle and interact, and therefore can be used for the benefit of others, as in healing. This book should inspire anyone wishing to give or receive healing — not in opposition to the benefits of modern medicine, but as a complementary pathway — in the great search for wellness."